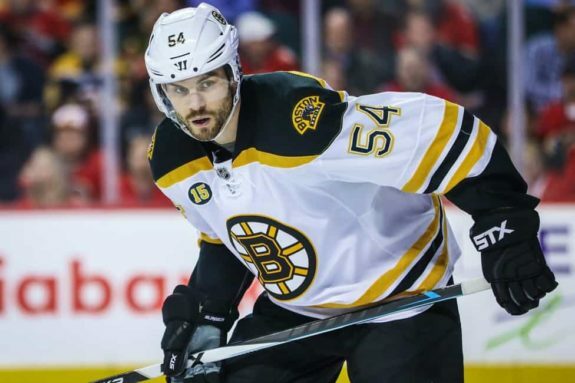 Should the Boston Bruins Consider Trading Adam McQuaid? 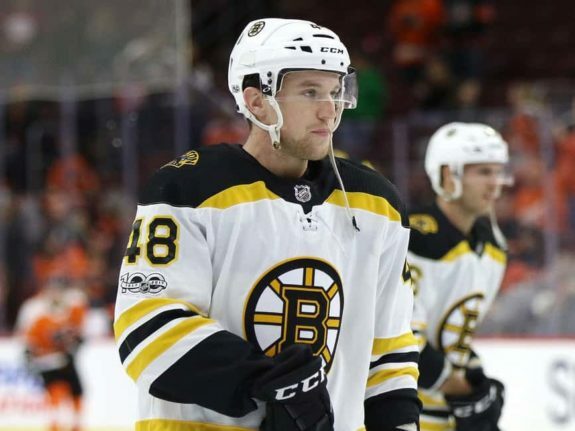 A strong core of veterans leads a howling pack of rookies bringing an extra punch to the Boston Bruins lineup this season. Entering the holidays, the blazing hot B’s won 12 of their last 16 games allowing them to unwrap 25 of a possible 32 points in total. They continued to streak on the other side, picking up three of a possible four points since Christmas. But the team in black and gold are at a crossroads. Those veterans and rookies have been getting along well on the ice and in the locker room, but they are finally beginning to clash on paper — some familiar names are looking out of place, starting with Adam McQuaid’s. This argument has nothing to do with No. 54’s play being subpar. In fact, I would argue that he is a solid bottom-four defender who could crack nearly any NHL team’s bottom pairing. But this is exactly why general manager Don Sweeney should consider trading the 31-year-old. Another reason for moving the defenseman that should at least be considered is the state of Boston’s salary cap. It doesn’t take a mathematician to realize Sweeney is going to have a difficult job re-signing key players with less than $1 million in cap space to work with. 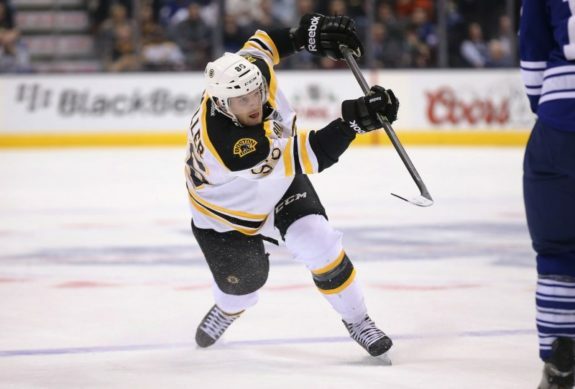 One last reason – and this is by far the best of the three – is that the Bruins are playing stellar defense as of late. If you don’t believe me, consider the fact that the Bruins have only given up eight even-strength goals in their past eight games, excluding an Alexander Ovechkin empty-netter on Dec. 14. Not to mention that this is being done while Boston has consistently skated three defensemen with a combined a total of 171 NHL regular-season appearances to date. Let’s start things off on a high note and take a look at just how good Boston’s defense has been during the holiday stretch. More specifically, the play of Matt Grzelcyk and Kevan Miller, who have anchored the Bruins’ bottom pair in McQuaid’s absence. Grzelcyk, a Charlestown-native, has come into his own this season. Fans and media alike have seen a lot of Torey Krug in his game — his puck-moving capabilities cannot be denied — and there is reason to expect improvements in his game at both ends of the ice considering he will only be turning 24 on January 5. Is McQuaid more sound than Grzelcyk defensively? Absolutely, but let’s not forget that Grzelcyk has been holding his own, and still maintains the offensive edge over No 54. It is also important to note that Grzelcyk plays on the left side while the veteran McQuaid is a lock on the right side. Now, this may not sound like too big of a deal considering the flexibility that Miller has in being able to play on both sides of the ice, but why make the switch when he has been playing so solid? I’ve seen a huge pep in Miller’s strides that I have not seen from him in past years. He is jumping into the offensive game, and it paid off against the Senators on Wednesday in the form of a goal. Some even argue that Miller is maturing into a top-four defensemen. 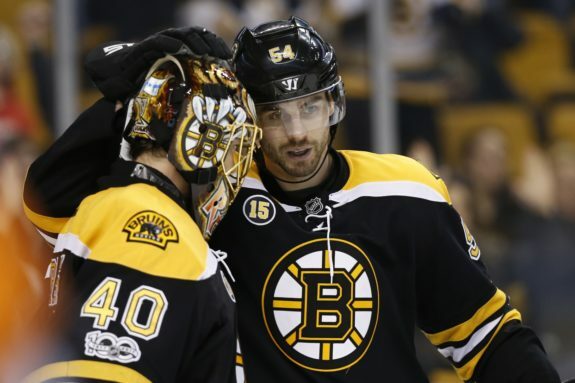 McQuaid also plays a very similar role as Miller when it comes to their defense and toughness. Both stand up for their teammates by dropping the mitts and throwing hits while remaining the masters of clearing pesky forwards from the crease (well, after their 6-foot-9, 250-pound captain). Considering Miller’s uptick in offensive capabilities this year, one may wonder if McQuaid’s role on the Bruins has become redundant. Miller has been solid on the right side, and if McQuaid comes in, you have to shift him to the left, not to mention sending Carlo down to the bottom pair so No. 54 can reunite with Krug on the middle pairing. I can’t readily accept sitting Grzelcyk for McQuaid either. Changing things up could alter the stellar results coach Bruce Cassidy has been seeing. In this situation, you have to ask yourself which player you see on this team in the future, and for this writer, that’s the younger and most promising of the two. That’s who I want playing against NHL opposition. Well, can’t the Bruins just hold onto McQuaid for the time being? Possibly, but I would argue against doing so: Grzelcyk is set to be a restricted free agent at the end of this season and will want at least $2 million if he continues starting, possibly more if he continues soaking up power play minutes. Also, McQuaid will be an unrestricted free agent following the 2019 NHL Playoffs, making it a risky transaction for any team to bring him on next year. That deems the present the prime time to move him. It’s important to consider who else Sweeney will have to re-sign in the Summer of 2019: Danton Heinen, Noel Acciari, Charlie McAvoy, Brandon Carlo, Jakob Forsbacka-Karlsson, Peter Cehlarik and Zane McIntyre. When McQuaid’s $2.75 million contract is up, he will likely get the boot in favor of McAvoy and Carlo’s expensive deals. If Heinen continues to soar and McIntyre takes on the backup role by then, McQuaid could see himself fall back even further in line. The value the Bruins could receive in return for No. 54’s services would not be all that bad either, especially if he is to see at least some ice time before the trade deadline. A draft pick outside the first round is not out of the question in a cap-dump scenario, but the Bruins could take on a player on an expiring deal as well. If the Bruins don’t move McQuaid in the near future, they will likely lose him to free agency for nothing. Considering he is day-to-day and a game-time decision for Saturday’s matchup against the Senators, we could see him slip into the lineup and perform quite well. Though there are other options, when you start piecing together the roster of Boston’s future, McQuaid just doesn’t seem to fit in.